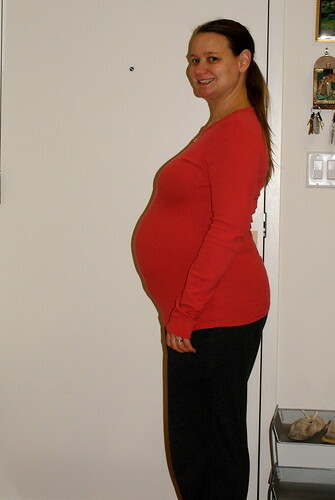 Welcome to the Third Trimester! I’ve made it to the third trimester! After being inundated for weeks with articles about all the discomfort I’ll feel and how uncomfortable the third trimester is as compared to the second, I’ll admit I was a little concerned. I already wrote about having rough days and about some of the anxiety I’ve been experiencing. It has continued off and on like that, but for the most part I have still been feeling great. I had a couple of rough nights in a row, struggling to sleep with a headache one night and then extreme heartburn the next. The good news is that I’m learning to deal with the discomforts so they’re not incapacitating. I now know that if I have a neckache before bed, it’s best to just take the extra strength Tylenol before I even try to sleep, otherwise I’m guaranteed to wake up in a level of pain with which I still have difficulty coping. I’ve also made the switch from Tums to Zantac since exceeding the sixteen tablet limit for Tums proved much easier than I had imagined. What is the best tip that I have for avoiding heartburn in pregnancy? No, I don’t think you should avoid acidic foods. I tried that and not only did it not work, but I found skipping foods I love like tomatoes, oranges, and balsamic vinegar is just not worth it. My advice is to avoid bending over! The worst heartburn I’ve had so far is after a yoga class in which I could feel the acid coming up my esophagus as I tried to hold a downward dog or even child’s pose. I’ll talk to my instructor this week about alternate poses. I’ve also started leaving the bottom shelf of the dishwasher for Dave to unload and we’ve swapped our dresser drawers so mine are at the top. Unfortunately, I’ve been falling behind on my blog posts as a result. I’m hoping that I just went through an adjustment period and that the new techniques I’ve learned will help me continue with most regular activities. If that’s the case, great! But I also have to be prepared to accept that I may not be able to keep up with everything. I’ll have to come up with some techniques for dealing with that as well. Maybe I will only be able to post to my blog 1-2 times each week? Better yet, perhaps I can shorten my posts and put less time into the planning and proofreading stages. We could hire someone to clean more often instead of once every few months when we’re desperate, like we do now. I could work smarter, not harder by reminding myself that I don’t need to set aside hours for writing. I can accomplish a lot in brief twenty minute intervals. Go Katie! You can do it! Katie, here is my advice for dealing with the third trimester…rest when you can, because growing a baby is hard work! Don’t kick yourself if things don’t get done, enjoy being pregnant and the biggest piece of advice is to buy a body pillow if you don’t already have one! I used to cuddle with it, I would throw my leg up over it and it really helped with the back ache towards the end. You look great by the way, I wish I had looked that good pregnant! I second what Al and Sarah said!